Renault and Volkswagen engineers had the great minds to think alike in 1976. Each group took their respective manufacturer’s humble three-door hatchback and beefed up it with go-faster components – creating a whole new breed of affordable performance car for enthusiasts. 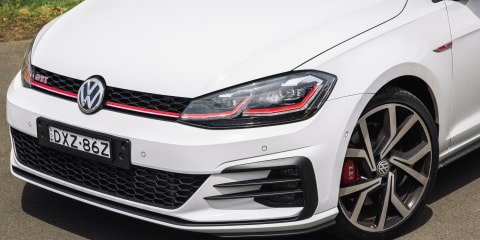 It’s the Volkswagen Golf GTI, however, rather than the Renault 5 Alpine (or 5 Gordini, as it was known in the UK) that took credit for popularising the hot-hatch concept, and only the GTI has become a global household name. Yet while few would recall the fast-5 (especially in Australia where it wasn’t sold), the French brand, via its Renault Sport division, has established itself over the past couple of decades as arguably the hot-hatch master. The new, 2018 Renault Megane RS and the latest, MY19 Volkswagen Golf GTI, then, are both brimming with heritage. The Hyundai i30 N? Well, er, not so much. But we may well be looking at the start of something new with the N sub-brand. History certainly didn’t mean anything earlier this year when the i30 N shocked the GTI with a victory in our head-to-head test. Volkswagen isn’t a brand to take things lying down, though, and just months later we have a heavily updated, MY19 GTI that adopts some key kit from the former, limited-run GTI Performance. While the GTI is DSG-only now (owing to the new WLTP fuel cycle causing some chaos among European manufacturers), those MY19 changes make for a worthwhile rematch. The latest Megane RS interrupts the two’s company to form a crowd-pleasing trio. Its predecessor was the segment’s dynamic benchmark, though here we’ve opted for the Megane RS EDC rather than a manual variant with the more focused Cup suspension as a more natural, all-rounder rival to the GTI. Our aim is again to find the hot-hatch for less than $50K (hence no Honda Civic Type R) that will please more of the people more of the time – the car that can combine quick performance and entertaining dynamics with everyday practicality, driveability and liveability. The Golf GTI is no longer available for less than $40,000 (at least officially, as you may well still find some three-door GTI Originals hanging around dealerships). For MY19, it’s a $45,490 single specification, with the only option of a cheaper GTI the $30,990 Polo version. With the loss of the manual gearbox, getting into a five-door GTI now costs $4000 more than before. The positive perspective is that the increase is only $1500 over the DSG version despite a heap of extra kit, while the MY19 GTI is $2500 cheaper than the Performance Edition 1 while grabbing most of its features and adding two doors. Still a fair bit cheaper, and yet that pack gives the Korean several features the others can’t match: wireless smartphone charging, electrically adjustable front seats, and heating functions for both the front seats and steering wheel. The Hyundai is also alone with digital radio, though while all models have autonomous emergency braking and some form of lane-keeping tech, the i30 N misses some useful driver aids offered elsewhere. Adaptive cruise control is now standard on the GTI, and the Golf continues to feature blind spot detection and semi-automatic (self-steering) parking. All these are matched by the Renault that kicks off at $44,990 in six-speed manual form or from $47,490 for the EDC (dual-clutch auto) version we’re testing. That places the RS EDC $2000 above the GTI DSG, though the Renault (like the Hyundai) adds bigger (19-inch) wheels – and bespoke bodywork if anyone places value in that. The subjective verdict from our trio of testers was unanimous: the Renault is the most visually striking hot-hatch here. What difference does 20 years of turbocharging make? Well, 70kW and 1.7 seconds in the case of the Golf GTI. It’s 20 years since the GTI first moved to forced induction, with the 110kW 1.8-litre Mark 4 of 1998 that went from 0-100km/h in 7.9 seconds. With MY19 bringing more power for the latest update of the seventh-generation GTI, there’s now 180kW and a 0-100 sprint cut from 6.4 to 6.2 seconds. The GTI is the only member of our trio that doesn’t break the 200kW barrier. Hyundai’s i30 N produces 202kW from its 2.0-litre turbo four-cylinder, while Renault Sport extracts even more (205kW) from a smaller turbo four of 1.8 litres. Whichever way you go here, though, you’re spoiled for everyday driveability thanks to the inherent flexibility of tubby turbo torque. The Hyundai’s 353Nm is the lowest torque figure, though arrives the earliest and covers the widest engine band – 1450-4700rpm. Kickdown acceleration also induces overboost for a maximum 378Nm. Sort of in the middle of those figures lies the GTI’s 370Nm, available between 1600 and 4300, with the RS’s 390Nm taking BIG (best in group) honours. And don’t let the fact that figure doesn’t kick in until a relatively late 2400rpm fool you. The Renault’s engine starts to pull earnestly from just under 1000rpm. The i30 N has the most obvious turbo lag at low revs, though it’s fairly minor and short-lived. Essentially, none of these hot-hatches disappoint in the way they perform, though each one sounds quite different. The DSG GTI, strangely, seems to have lost its upshifting exhaust blurts in the transition to MY19. There’s some induction noise but otherwise the Volkswagen sounds refined but overly polite for a hot-hatch. Close your eyes while having a go in the i30 N (which is not actually advisable) and it’s possible to imagine you’re competing on a World Rally Championship stage as the Hyundai’s exhaust pops, bangs and crackles (in N mode) for maximum amusement. The i30 N and RS both use a form of amplification for their soundtracks. Hyundai employs an Electric Sound Generator at the base of the windscreen and an Active Exhaust, while Renault opts for a sound boost in Sport/Race modes through the speakers (as with the Clio RS). Renault Sport insists the actual sound is derived from the engine tuning itself, though, and it certainly sounds natural enough to us. And entertaining enough. There’s prominent over-run burbling when lifting off the throttle, and the RS produces the best noise under hard acceleration – notably the angry bark that accompanies flat-chat paddled gearchanges. The RS also showcases Renault’s progress with dual-clutch gearboxes. The Megane’s EDC is an improvement on the version used on the Clio RS and is the best example of these pseudo-manual transmissions we’ve experienced outside of a Porsche PDK. Where the GTI’s DSG (now a seven-speed rather than six-speed) is still prone to some hesitation at junctions and roundabouts, the RS’s EDC responds smartly to off-on throttle applications. Hyundai is still developing a dual-clutch for the i30 N that is not expected until late 2019. The six-speed manual at least has a rev-match function that will blip the throttle on downshifts for those who don’t heel’n’toe. The shift action is okay, though notchier than we’d like and the biting point could be more definite. Official fuel consumption figures point to the Hyundai as the thirstiest car here, with its lab-derived 8.0 litres per 100km comparing with 7.5L/100km (RS) and 6.5L/100km (GTI). After our mix of normal/quick driving, however, the Megane proved to have the greater appetite for fuel with its trip computer indicating a 15.8L/100km average. The i30 N was registering 13.2L/100km while the GTI was in the mid-12s. Such differences are unlikely to sway hot-hatch buyers one way or another, though the RS also requires the most expensive fuel – 98 octane – where its rivals will run on 95 premium. The Megane RS is the odd-car-out without an adaptive suspension system. Instead, Renault offers an optional Cup chassis that forms part of a $1490 Cup Pack, which also adds black ‘Interlagos’ rims, Brembo brake calipers, harder-compound brake pads, and a Torsen mechanical limited-slip diff. There’s a catch, though, as that Cup Pack is available only with the six-speed manual gearbox. It means auto buyers can’t access the most dynamic version of the Megane RS. We know from back-to-back testing that the diff, brakes and Cup chassis (which stiffens the anti-roll bars by 10 per cent, springs by 25 per cent and dampers by 30 per cent) all help give the Renault an incremental lift in handling. It’s not a huge edge, though, and the benefit of the standard Sport suspension is an outstanding balance between ride comfort and sharp roadholding. In fact, there are some luxury hatchbacks we could mention that don’t absorb bumps (small or large) and potholes anywhere near as well as the Megane RS EDC, let alone the firmer GTI and even-stiffer i30 N.
Yet on our most focused stretch of road for dynamic testing – a 3km downhill (then back up again) sequence featuring hairpins, S-bends and sweeping corners – the Megane RS entertained with its effortlessly rapid changes of direction and its flat, planted cornering stance that’s aided by the widest tracks and widest rear rubber here. It’s just extremely debatable whether Renault’s four-wheel steering – also found on the Megane GT – gives the latest RS any greater agility than its predecessor on a twisty road. Turning the rear wheels in the opposite direction to the fronts below 60km/h and in the same direction at higher speeds, its most obvious benefit seems to be around town, where it makes three-point turns and roundabouts a doddle. It certainly doesn’t help shake off a chasing i30 N.
The Hyundai feels more like an old-school hot-hatch after the RS, beyond the fact it’s you rather than the car changing gears, and there’s pure joy to be had from hustling it along a great road. Its steering – enjoyable meaty in Sport mode if not any more tactile – is also the most assertive in this group when it comes to turning into corners. No other Korean car can put as big a smile on your face, and that includes Kia’s Stinger. And neither of its rivals here can match the i30 N’s acceleration out of ultra-tight corners. 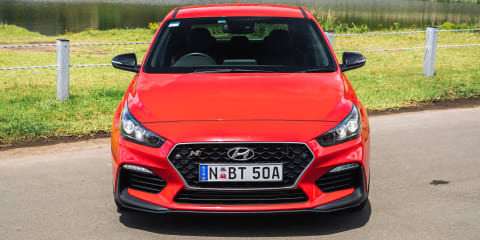 All three hot-hatches employ some form of torque vectoring up front to help limit understeer and boost traction, though the Hyundai’s electro-mechanical diff bites into the bitumen that much harder as the i30 N claws its way out of hairpins with impressive aggression. The RS needs the mechanical Torsen diff from the Cup pack (and previous Megane RS S275) to enjoy a similar slingshot effect, though the Renault’s traction is surprisingly good considering it’s using a simpler, brake-based approach to giving the outside-front wheel more purchase. VW’s previous regular Golf GTI struggled with a similar technical approach, easily spinning its inside-front wheel in response to aggressive mid-corner throttle, so MY19’s Front Locking Diff – an active, clutch-based set-up – undoubtedly improves its low-speed cornering performance. The GTI, however, remains a hot-hatch at its most enjoyable up to eight-tenths – and in isolation. Start to push the limits and the Volkswagen simply can’t keep pace with its rivals. There’s notably more body roll from the narrowest car here, and the GTI’s chassis ultimately starts to become flustered when asked to negotiate a series of tight, alternating corners. And while MY19 brings larger brakes from the Golf R, stopping confidence is even higher in the Megane and i30. The Hyundai’s brake pedal feels quite firm in regular driving, though you get used to it. Perhaps inevitably for three cars wearing performance-focused tyres (Pirelli P Zeros for the i30 N and GTI; Bridgestone Potenzas for the RS), tyre roar on coarse-chipped country roads is prominent. For what it’s worth, the i30 N is loudest and the GTI quietest in this respect, but none is hushed. The i30 N’s suspension feels the most unsettled cruising along such roads, and it struggles to deal with large dents in the road surface that the GTI copes well with and the RS just dismisses as if they didn’t exist. Credit here, no doubt, to the Renault’s damper-within-a-damper hydraulic bump-stops. For freeways as well as country roads, the Megane RS and Golf GTI feature useful adaptive-cruise systems that can maintain a distance to the vehicle ahead where the i30 N will only maintain a set speed. The previous Megane RS’s interior was one of its few let-downs – looking somewhat bland with its lack of inspiring design and materials. There’s improvement for the new model, including vastly easier access to the rear seats, of course. While some budget-price plastics from the standard Megane are still evident, there’s plenty of squidgy surfaces – including padded door sections featuring a pattern that mimics the black zig-zag weave of carbon fibre. That pattern is also used on the RS’s standard seats, although our test car featured optional ($1190) Alcantara upholstery with red ‘RS’ headrest logos. Either way you go, the front seats offer excellent support with their deep bolstering while allowing a good degree of freedom. Those seats contribute to a sporty cabin ambience, along with a liberal use of red stitching – including on the beautifully chunky smooth/dimpled leather steering wheel (which also features a red RS logo and the RS-traditional red top-centre strip). The Renault’s dash is dominated by a vertical slab of black plastic that’s thankfully made more interesting visually with an array of dials and buttons, and most notably the 8.7-inch portrait touchscreen. As with Teslas and Volvos, this format has its advantages – the two most obvious being reduced scrolling and the ability to see more of a highlighted route on map guidance. The touchscreen’s response is quick, though page loading can sometimes have a slight delay. Switch to the i30 N and you get a sense that almost the entire budget for the car was spent on engineering, as the cabin presentation doesn’t match the exhilaration of the driving experience. The front seats and steering wheel are suitably sporty, though otherwise there’s really only the Hyundai WRC light-blue Drive Mode and N Custom buttons on the steering wheel trying to tell your friends they’re not in a regular i30. Good job the i30 is well designed inside, then, and we don’t mind the only analogue instrument panel here, either, especially as it suits the older-school feel of the N.
That’s not to suggest there’s nothing contemporary, as the Hyundai’s ‘floating’ touchscreen infotainment system is sufficiently up with the times, while neither the RS nor GTI match the i30 N’s wireless charging pad. In every other respect, though, the Golf GTI brings the most sophistication – stepping up another notch for MY19 with VW’s configurable digital driver display that is now standard rather than optional. It’s the perfect complement to the Volkswagen’s group-benchmark infotainment system, which is the smartest to look at and the smartest to use. An 8.0-inch screen comes standard; buyers can tick the $2300 Sound & Style package (fitted to our car) that upgrades to the 9.2-inch version with non-touch page-swiping Gesture Control and a 400-watt Dynaudio Excite system (plus the bigger, 19-inch wheels). It’s also worth bearing in mind that a fully optioned GTI falls within price striking distance of the much faster, better-sounding Golf R.
The GTI, like the i30 N, could look sportier inside, yet its cabin feels the most premium out of our contenders – a factor that undoubtedly contributes to the VW’s popularity. It’s also the best packaged, because despite the Golf being the shortest car here (and with the shortest wheelbase), its rear-seat space is comparable to that of the longest-in-group Megane. Legroom is tighter in the back of the i30 N, if certainly not to the point of discomfort provided tall passengers aren’t trying to sit behind tall front occupants. It’s a close call between the Hyundai and Renault for comfiest rear bench. All three provide plentiful headroom, as well as centre armrests and cupholders. Only the Hyundai misses out on rear vents. Each hatch features a 60-40 split-fold ratio for its rear seatbacks, with the GTI scoring higher practicality points for its completely flat floor and ski-port. There’s a small step in the Renault where the seats fold, while there’s an even bigger step in the Hyundai – as well as a strut brace (which can be removed). The i30 N, however, has the deepest boot, plus handy hooks, luggage net, and a 12-volt socket not offered in the Megane. The Megane has the widest boot – and the biggest by quoted capacities: 434 litres v 381L (i30 N) and 380L (GTI). So, the Megane RS will cost owners more to fuel based on our average fuel-test figures and its 98-RON diet, and there’s further bad news. Renault Australia no longer offers a five-year warranty for its RS models – dropping it back to the below-industry-average three years (yet other Renault models remain on five, inexplicably). We’d recommend bartering with your local Renault dealer for five years, which would match the warranty offered by Hyundai. Volkswagen has also upgraded its permanent warranty to five years. Roadside assistance is complimentary for each vehicle provided owners adhere to servicing schedules with official/supported dealers. This is offered up to 10 years with the i30 N, for five years with the GTI and up to four years with the RS. Hyundai’s annual servicing costs are the cheapest in this group if 10,000km aren’t exceeded in a 12-month period, with visits charged from $299 for a lifetime capped-price-servicing program. Volkswagen’s scheduling acknowledges the 15,000km average Australian annual mileage, though visits are expensive – ranging between $377 and $791 over five years (based on the GTI Performance as VW doesn’t currently provide information for the MY19 GTI). That makes for a sizeable gap if you take mileage out of the equation, with the i30 N costing $1595 over five years compared with $2773 for the GTI. Base it on costs up to 60,000km and the difference shrinks to less than $400, with the i30 N’s $2015 total charge playing the GTI’s $2396. The downside, however, is that Renault’s program lasts only three years. The MY19 Golf GTI continues the strong appeal of this iconic hot-hatch ever since it roared back into form with the 2005 Mark 5. For those buyers who don’t intend to take their car to the ragged edge of adhesion, the GTI provides satisfying performance while mixing in an interior unrivalled here for its premium presentation and digital technology. It’s a pity to lose the manual gearbox, though, and a higher price tag costs the Volkswagen some of its long-running “attainable performance” factor. The MY19 changes aren’t sufficient to overcome the Hyundai i30, either. As motoring journalists, we do our best not to be sucked into the hype surrounding any car. So, including the i30 N in this test also allowed us to double-check that our previous adoration for the car wasn’t influenced in any way by the shock of driving a Hyundai that felt genuinely exciting to punt around. It took only a couple of corners to confirm our original thoughts. The i30 N is an unadulterated driver’s car, with a cheeky, boy-racer charm that brings out your inner hooligan. You might say it has both chuckabilty and chuckle-bility. Yes, there’s room for improvement with the manual’s shift action, and the cabin would welcome some more special touches and a bit more room in the back. And while the i30 N offers strong bang for your buck as the only car you can buy here for less than $50,000 driveaway, the Renault Megane RS offers more technology in the forms of a multi-downshift dual-clutch auto (which performs better than VW’s DSG), double-damper suspension, and all-wheel steering. The French hatch also comes with bespoke sheetmetal (and the best exterior colours here we reckon through the optional Tonic Orange and Liquid Yellow). You also get five doors rather than just three with the latest RS, of course, to give it extra practicality. Arguably the biggest key to the Renault’s success, though, is its seemingly magical Sport chassis that is Porsche-like in its ability to deliver suppleness and compliance without sacrificing superb body control and confidence-inspiring roadholding. Yes, you’ll probably want the RS manual with Cup chassis (or await the upcoming Trophy variant) if you’re seriously considering track days, but the Sport chassis doesn’t suggest it would be significantly less capable while providing superior ride comfort. 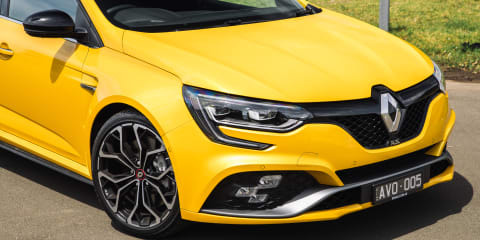 And if hot-hatches have always been about duality – the ability to marry entertaining performance and everyday useability – neither the GTI nor the i30 N can quite match the Renault Megane RS’s breadth of abilities. In fact, you might say that the Renault Megane RS manages to out-GTI the GTI as the great hot-hatch all-rounder.